Welcome to Grace Valley, California---where blood runs thicker... ties bind stronger... and love is all the more sweet. June Hudson grew up in Grace Valley, the daughter of the town doctor. Leaving only to get her medical training, she returned home and followed in her father's footsteps. Some might say she chose the easy, comfortable route... but June knows better. For June, her emergency room is wherever she's needed---or wherever a patient finds her. Always on call, her work is her life, these people her extended family. Which is a good thing, since this is a town where you should have picked your husband in the ninth grade. Grace Valley is not exactly the place to meet eligible men---until an undercover DEA agent suddenly starts appearing at all sorts of strange hours. After two months of putting it off, apparently I was still bound and determined to finish this book for reasons I don't think I will ever understand. While things DO happen throughout the book and there are moments of excitement, really, a whole lot of NOTHING actually happens in this entire book. 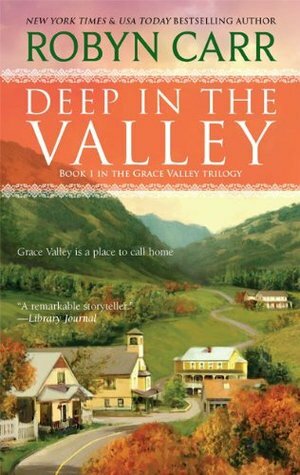 It's admittedly just an accounting of several, everyday mundane activities surrounding the people of Grace Valley with a lot of side tangents, Cliff's Notes history-telling of the town's founding and development, talk of drug runners and DEA agents crawling all over the mountains, and a lot of domestic abuse. And for a Contemporary Romance, there is extremely little romance. What little romance there is in this book isn't even easily acceptable by yours truly, if only because we REALLY take insta-love to a higher level. There were three prominent interactions between the heroine and her love interest before the word "love" started getting thrown around. And so the main romance for our main heroine, June Hudson, was barely even there. There were three encounters, and this love interest can't even be filed under the category of main hero or even main character because he's never even in the story. After the first meeting in which our love interest pretends to faint so that he's no longer holding a gun on her, and so his criminal partner wouldn't be suspicious of him, June is obsessed with said love interest. She speculates that he MUST be an undercover law enforcement agent, because there's absolutely NO WAY she could fall for someone who's a criminal--because that makes so much sense... Then he shows up again and suddenly the two are contemplating becoming a couple. And then the guy keeps entering her home and doing little things for her, like feeding her dog and leaving flowers on her bed WITHOUT HER KNOWLEDGE. And she's okay with this. He even shows up in her home, waiting for her when she comes home... and again, she's okay with this. Because obviously he's a good person because, and she repeats over again, she would never fall for the criminal type, and because he'd pretended to faint so that he wouldn't be pointing a gun at her anymore. It would actually be a nice Meet Cute if there had been more interaction between these two before the insta-lust and insta-love got thrown out there. Because, yes, he turns out to be one of the good guys... except I still don't see how that justifies him just wandering into June's home without being invited first. I mean, during their second meeting, June was even hesitant about inviting him into her house while she was there because that would be taking their relationship to a higher level than she's prepared for. And yet, when she's NOT at home, he's just making himself at comfortable in her house. Because when is it ever okay for some strange man to just show up in your home whenever he feels like it without your knowledge, even in a community where no one locks their doors? Anyway as for the rest of the book: Character interactions were awkward, lots of decision-making processes made little sense. And despite being a small town priding themselves on being close-knit and there for each other, these people don't even know how to communicate with each other properly, nor look out for each other properly, considering all the bad stuff that happens throughout the book that could have been avoided if people really DID just step up and try to help each other. Anyway... rambling aside (so much for not planning on writing a review), I'm not sure if I'll continue reading the rest of these books if they are written in the same vein of logic. Because for a Romance, this book has very little of that; for a piece of Chick Lit, self-revelation piece about a woman's ticking biological clock, there's also very little development in that aspect as well.